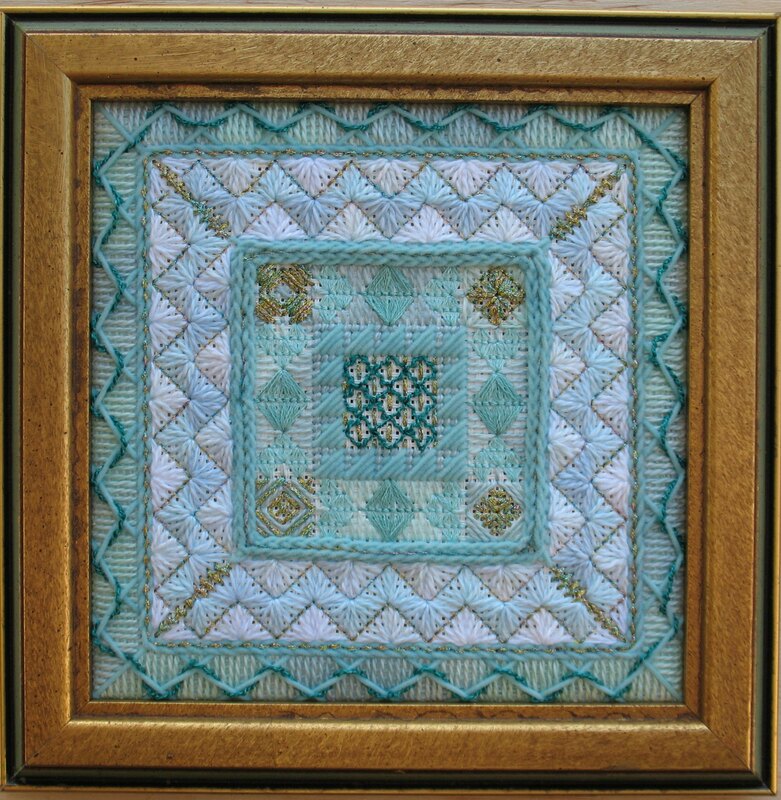 When I was given a lovely blue and gold square frame, I decided to design a piece of needlepoint for it. I like to be challenged and felt I had learned enough from recent geometric designs we had done as part of ANG Main Line Chapter projects to make the attempt. Because the square frame has an inner portion of thin royal blue and gold strips, then a wider blue strip, and lastly a gold strip, I wanted to create that same ‘frame within a frame’ effect in the design area and keep the piece symmetrical. I found enough triangular-shaped stitch patterns that squared up nicely and didn’t require much compensation. Although I had to stitch no larger than the opening for the frame, I didn’t plan everything out in advance. 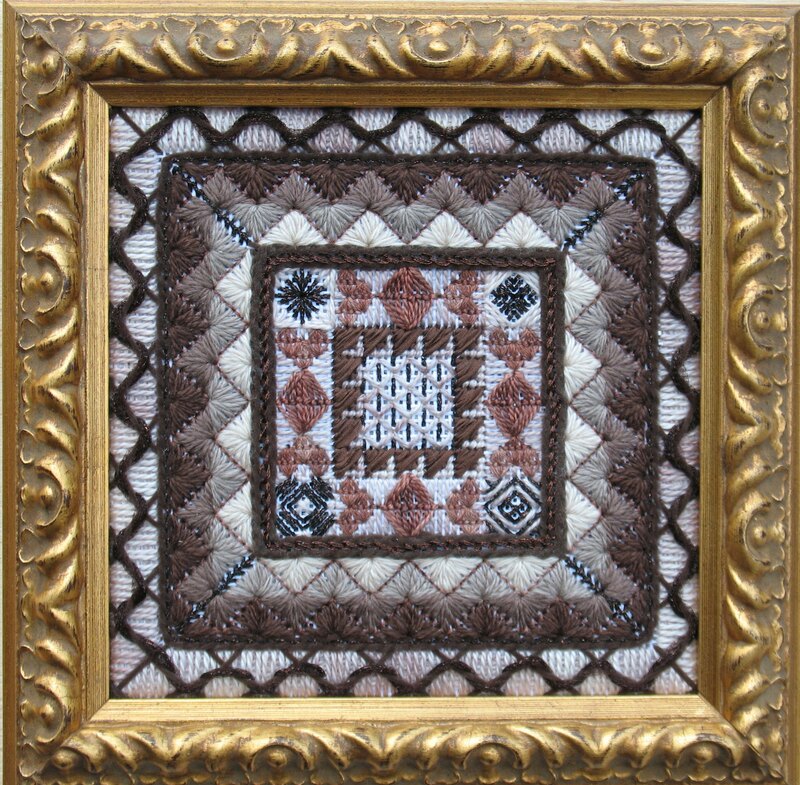 For example, the Triangular Ray band, had a diagonal gap that filled in nicely by the Pearl stitch, with its small triangle portions, and really added to the effect of depth. The Raised Lattice Band for the outermost band could be as wide as needed. It all seemed to fit into place as I progressed. I couldn’t think of anything other than, ‘Trianguality’, for a name but I knew it wasn’t good. So, I solicited input from the wonderful women who help take care of my mother. And, I just fell in love with Kathy’s suggestion, “Points of Tranquility”. Thanks again Kathy! When I showed off my finished piece at our end-of-year dinner and my fellow Chapter members asked “Who’s design is that!? !”, I was thrilled. Then, I was flattered when they actually wanted to stitch it as a project. From my scribbled notes, I wrote my first stitch guide using just Adobe Acrobat. And, to make sure I was writing everything down, I stitched a second one in another color family. Then, when we stitched it in the fall, I did another in a third color. So, I distinguish each “Points of Tranquility” by adding “in the Sky” for the blue piece, “on the Earth” for the brown piece, and “in the Sea” for the aqua green piece. Thanks for the frame Dottie & for many tranquil visits to your Pocono home! “Points of Tranquility” scored the lowest (73% of total and 19% lower than the top score in the category). But, this was my first attempt at a geometric design and not surprised that they had issues. The comments get quite technical but key issues were around values chosen and confusion about the focal point. I’m still struggling with seeing different focal points in each piece. Apparently, in the blue, there are 2 focal points – one within the navy/metallic area and the other the true center; in the brown, it is the area enclosed with the brown metallic; in the green, it is the true center. I’ll keep studying them! One of the elements I liked the best was the outer border. 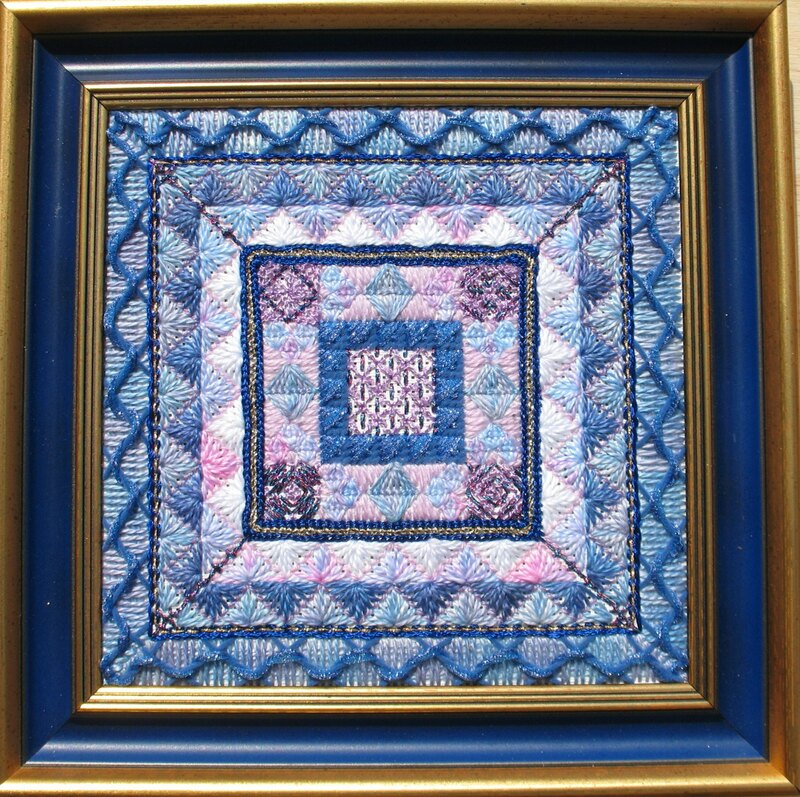 I just love how it was described, “Your wrapped stitches for the outer borders are an effective and inspired selection. It is effective, provides a variation in texture and loft to the pieces and lends itself to the utilization of subtlety while still providing weight for balance of the piece.” I said it before and I’ll say it again, I really appreciate the thoughtful and thoroughness of each critique.